Study Medical Photos: A 36 Year Old Woman presents With Tingling And Pain In The Right Thumb And Wrist. A 36 Year Old Woman presents With Tingling And Pain In The Right Thumb And Wrist. A 36-year-old data entry clerk presents to your office complaining of tingling and pain in the right thumb and wrist, worse by the end of the day. Occasionally, she is awakened at night from the pain. 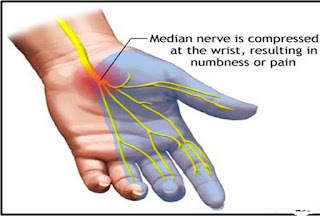 Phalen's, Tinel's, and median nerve compression tests are positive. The hand and wrist appear otherwise normal, with full range of motion, good perfusion, and no focal signs of inflammation or trauma. Q 1. What is the most likely diagnosis? Q 2. Which of the following treatment modalities would be your first choice in alleviating pain in this patient? Discussion: A trigger point is defined as the presence of discrete focal tenderness located in a palpable taut band of skeletal muscle, which produces both referred regional pain and a local twitch response. This patient had no signs of local inflammation. In the absence of a definable trigger point, dry needling or lidocaine injection is unnecessary. Local application of steroid and/or lidocaine, either by direct injection into the carpal tunnel space or by iontophoresis, may significantly alleviate the pain from soft tissue inflammation in carpal tunnel syndrome. Iontophoresis is the use of electric impulses from a low-voltage current to drive topical corticosteroids into soft tissue structures. Wrist splinting is a noninvasive, cost-effective treatment to relieve compression of the median nerve, but it requires a great deal of patient compliance. Surgery is not the first step in this patient's management but should be considered if all other treatment modalities fail.